Dive into a world torn apart by a powerful race with phenomenal powers of the mind – and none of the heart. In a world that denies emotions, where the ruling Psy punish any sign of desire, Sascha Duncan must conceal the feelings that brand her as flawed. To reveal them would be to sentence herself to the horror of ‘rehabilitation’ – the complete psychic erasure of her personality . . . Both human and animal, Lucas Hunter is a Changeling hungry for the very sensations the Psy disdain. After centuries of uneasy co-existence, these two races are now on the verge of war over the brutal murder of several Changeling women. Lucas is determined to find the Psy killer who butchered his packmate, and Sascha is his ticket into their closely guarded society. But he soon discovers that this ice-cold Psy is very capable of passion – and that the animal in him is fascinated by her. Caught between their conflicting worlds, Lucas and Sascha must remain bound to their identities – or sacrifice everything for a taste of darkest temptation . . . 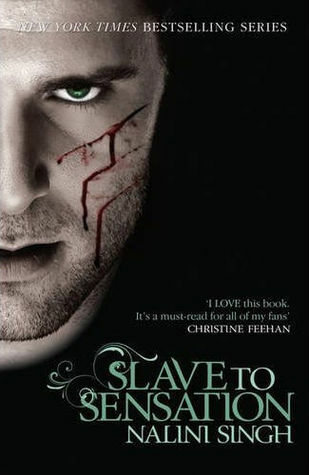 This book was recommended to me by a huge fan of the Psy-Changeling series. Sascha Duncan is a Psy, and daughter of a member of the Psy Council. The Psy have dedicated themselves to the eradication of emotion. But Sascha feels emotions, and her shields are beginning to show signs of wear as she grows older. Assigned to oversee a development run by Lucas Hunter, a Changeling, she finds herself among people who live and exude the sensations she must, as a Psy, deny herself. And yet she finds herself allowing sensation in, attempting to satisfy the cravings. But there is so much more to this book than that. There’s a serial killer who is known by the Changelings to be Psy, and there’s a member of the Psy Council who wants to have a private chat with Sascha. And there are leopard cubs. I’m not sure what I was expecting when I began to read this story, but what I got out was an excellent, well-structured story with plenty of suspense, tension and, well, sensation. One of the things I really appreciated was how “sensational” (for want of a better word) it was. With Sascha’s obsession with and craving for sensation, Singh focused in on this beautifully, communicating Sascha’s need so well. This book wouldn’t have been the same without this element, and it totally reinforced the title. I also liked how protective Lucas is as a person. To a fault, in some instances, but for the most part his heart is in the right place. An excellent read for those who love animal shifters and characters with psionic abilities. I will be looking out the next book in the series.